Blocks of rooms have been reserved at Crowne Plaza Hotel 80 rooms reserved (no code necessary) and Regency Suites Hotel 50 rooms reserved; use the reservation wizard option, enter the dates, and the promotional code QMATH. These blocks will expire on September 7, 2016. 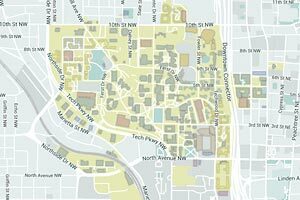 The following is a list of hotels close to Georgia Tech's campus. Please call for rates and be sure to ask if there is a Georgia Tech rate. If you are traveling to Atlanta for QMATH13 via plane, then the easiest way to reach Tech is the MARTA (~$2.50), though a Taxi is a reasonable option as well (~$35). The subway (MARTA) runs from the airport to within a few blocks of campus. At the airport, follow the signs to MARTA, which is the Atlanta Subway. You'll see the signs after arriving at the baggage claim area. The airport is the end of the south line. There are a couple of MARTA stations that are close to campus; the North Avenue station is within walking distance and the Midtown station operates a free trolley to campus. Maps below show detailed directions to the venue. To reach campus from the North Avenue station, ride the train north, to the North Ave MARTA station. Continue on North Avenue and turn right onto Cherry Street. Walk past the road barrier and the Skiles building, the second building on the left, continue to the walkway. The Clough building is at the right side of the bottom of the steps descending to the left. Once inside the building go down a flight of steps to the lowest level. Continue on North Avenue just before the second red light (Tech Parkway), turn right onto Cherry Street. Visitor parking lots can be found on the map in the footer. Continue on North Avenue just before the third red light (Tech Parkway), turn right onto Cherry Street. Visitor parking lots can be found on the map in the footer. Visitor parking lots can be found by clicking the map in the footer and select parking or search for visitor parking. It goes without saying, do not park in any handicapped, reserved or facilities only places. For restaurant information we suggest Open Table, (a campus map with close-by lunch options will be provided at registration). 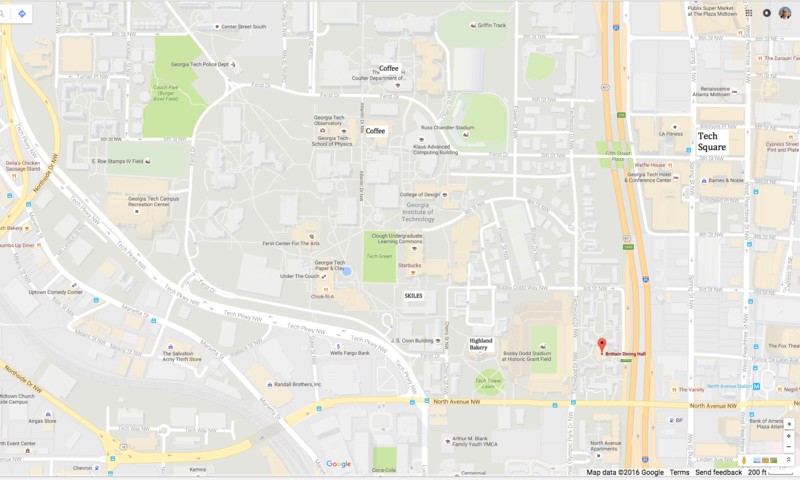 Here is a map showing the Clough Undergraduate Learning Center, the Skiles Building, and the locations of nearby places to eat. Satto Thai and Sushi Bar, 768 Marietta Street. Thumbs-Up Diner, 826 Marietta St., American breakfast and lunch. Amélie's French Bakery, 840 Marietta St., pastries, sandwiches, baked goods, specialty coffee. Peachtree St.: A bit further to the east of campus (20-30 min. by foot from the conference) are many restaurants along banquet on Monday evening will be at Gordon Biersch, just north of the intersection with 6th St. On Peachtree St. we are also partial to Escorpion at the corner of 5th St., and Barraonda at the corner of 3rd St.